In general, you can take any soup which calls for chicken and chicken stock and replace it with turkey. Turkey just has a stronger, more distinctive flavor which tastes like….turkey! But you can take my Chicken and Lime Soup with Avocado and use turkey there, or Italian Wedding Soup with shredded turkey instead of turkey meatballs, and so forth. Or just make a batch of stock and freeze it for a rainy day. This soup though, is the perfect antidote to all the richness from Thanksgiving dinner. It’s a nice, light broth soup with a little tang from fresh lemon juice. I love that it doesn’t taste like yesterday’s meal. I personally like eating my leftovers in a transformed way, as opposed to just heating them up and having the same exact meal the next day. Not that there’s anything wrong with that, of course. 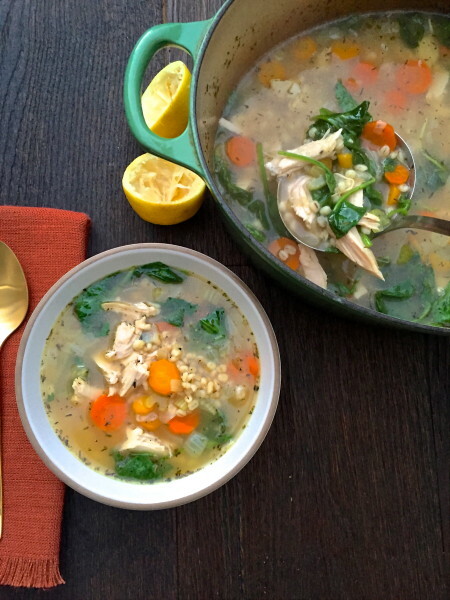 I had some turkey leftovers from a recent class, so I made this Lemon Turkey and Barley Soup for my family and they all, even Mr. Picky, loved it! 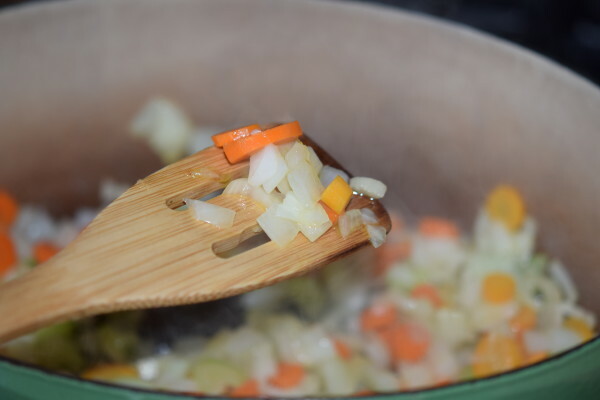 What’s lovely about barley is that it thickens up the longer it sits so I enjoy this soup even more the next day, and so did my kids when I put it in their thermoses for school lunch. If you are gluten-free, I think any kind of rice would be nice instead of barley. Be mindful of the cooking times, though. Brown rice takes 50 minutes and white takes 18. I asked the kids what they thought of the lemon juice in the soup and they all thought it was the perfect amount — definitely lemony, but not too much. I personally would have liked a little more lemon, but that’s something that can be added to each individual’s bowl, as well. 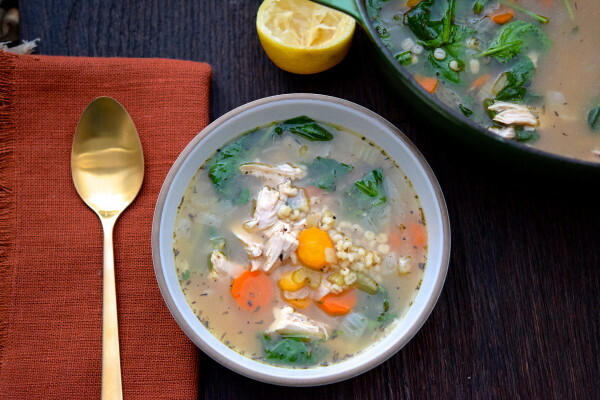 It’s a nice, fresh twist on a barley soup. 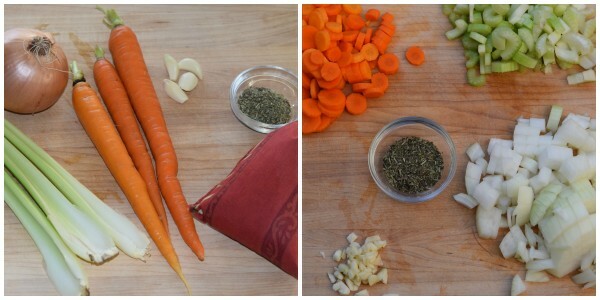 For a more traditional barley soup, check out this link here and sub turkey stock if you like. Ironically, this year my day after Thanksgiving will be different. I’ll be waking up before the sun comes up and heading over to KTLA Channel 5 (not in my pajamas) armed with my Thanksgiving leftovers to make some delicious recipes with the anchors that morning. If you are in LA and are interested in tuning in, my segment is scheduled for 9:45 am! Until then, I hope you have a wonderful holiday. I always remind myself in the midst of the planning and prep and cooking that this day is about being mindful of all we have to be thankful for — and there’s always, always something. I am so grateful for all of you and my students, from whom I learn so much and who inspire me every day! ¾ cup uncooked barley (not hulled – takes too long) I like Bob’s Red Mill or Arrowhead Mills, which say “pearled,” but they’re only semi-pearled. Warm the olive oil in a large pot over medium heat. Add the onion, carrots, celery and garlic and sauté until the onions are translucent, about 8 minutes. Add the herbs de provence and stir. Add the stock, barley, salt and pepper and bring to a boil. 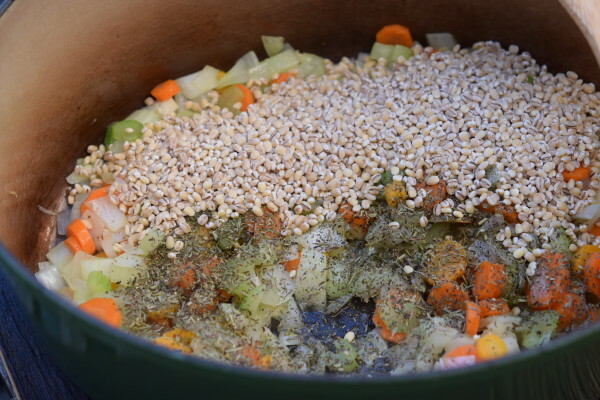 Lower to a simmer and cook partially covered until the barley is tender, at least 30 minutes. Stir in the cooked turkey and simmer until turkey is heated through. If you want the barley to become larger and thicken the soup a little, just simmer another 10-20 minutes. 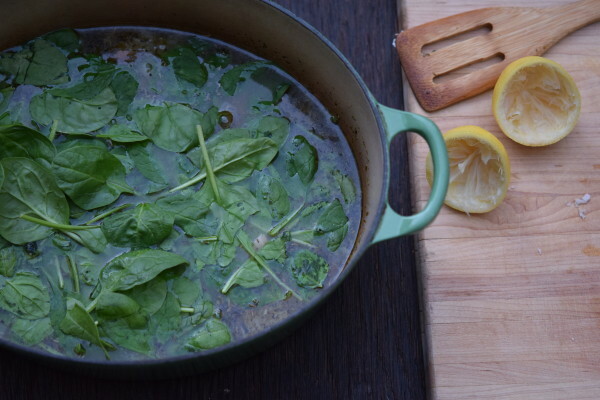 Stir in the lemon juice and spinach and cook until spinach is just wilted. Taste for seasoning and add additional salt, pepper or lemon juice, if needed. Serve with grated Pecorino or Parmesan cheese, if desired. * Herbs de provence is a blend of dried herbs which often include thyme, oregano, savory, marjoram, rosemary, and other herbs. If you don’t have herbs de provence, feel free to make your own blend of these herbs to use instead. ** You can also substitute 1-2 cups cooked grains and decrease the stock to 6-7 cups. You will just need to warm the grains through and not cook them for the full amount of time. I have to tell you that I made this soup again last week before we went on break for the PTA lunch for the staff at my son’s school. It was a hit again. It never disappoints. I had to hand out the recipe to several teachers. Most delicious!! I don’t remember if I mentioned it before but I also made it for my sister’s baby shower in October. Equally as loved. Thank you as always! When do u add turkey broth? Assuming after veggies are sautéed? Yes! Just fixed it. So strange that it was omitted. Thanks for bringing my attention to it. I feel the love through your recipes! Thanks again! So delicious. Love this soup! It’s a regular around her. Fresh, delicious, nutritious…great for when all three of my girls are arriving home at different times from sports practices. Another win! How wonderful your girls are enjoying such a wonderful, healthful soup. You’re a good mama! I love hearing this, Monica! Thank you for the feedback and for making me look good with your son’s teachers ;). Happy holidays! You are so welcome! You certainly deserve it 🙂 I hope to be joining you at one of your cooking classes in the New Year. Your class was on my birthday wish list and my kids bought it for me. I am very excited! I hope you are enjoying the holidays in New York with your family. How nice! I look forward to seeing you in the kitchen in 2016! Would love to see your KTLA segment, but I’m not in SoCal. Will it be on the station’s website, or anywhere else? Thank you, Miriam. 🙂 They usually post it on their website after it airs. Hi Pamela thank you for another wonderful recipe!! Do you think Farro (the precook end kind from Trader Joes’s ) would work instead of the barley? Thanks so much again!!! You’re welcome, Elizabeth! I think that would absolutely work. Enjoy!